One medium tomato contains 20 calories and 1.5 g of dietary fiber. Tomatoes are also good sources of vitamin A, B9 and C as well as minerals like potassium. Tomatoes contain an antioxidant known as lycopene which can lower high cholesterol levels. Lycopene in tomatoes prevents prostate cancer. The vitamin C in tomatoes helps prevent premature aging. 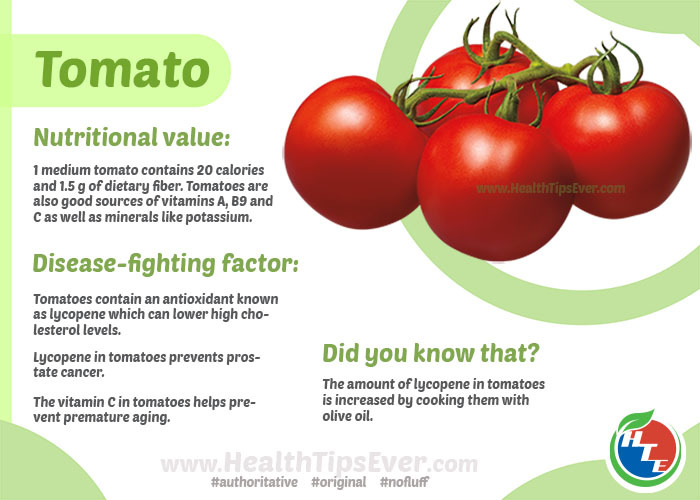 The amount of lycopene in tomatoes is increased by cooking them with olive oil. The editorial board of HealthTipsEver.com comprised of real healthcare workers mainly doctors and pharmacists of the highest academic qualification and long time practical experience. You can rely on us as well as you are warmly welcome to read the disclaimer. © 2013 - 2019 Health Tips Ever Magazine - All Rights Reserved.